I wanted to address a subject that marks. That divides, loves or hates. Because they are all types, sometimes graphic or realistic. Whether it is a representation of a horse, its name or just a sign that makes us think of its universe. I decided to show you several examples. 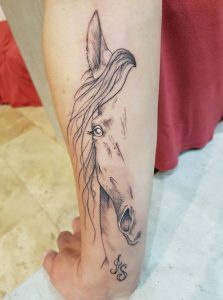 Each tattoo is unique, do you want the same drawing as another person without even knowing its history? It’s time to put a bit of the equestrian community in the spotlight. 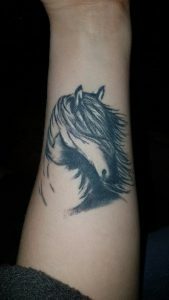 So it is naturally that some of his tattoos are yours and others recorded on the horse Pinterest and me. 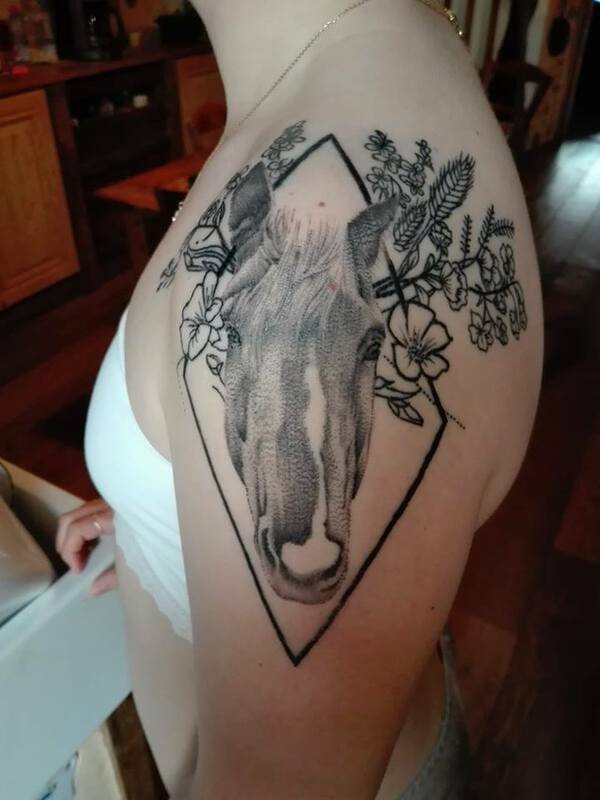 For this first article on equestrian tattoos, I will only share horses. You’ll have to wait a bit for irons and other ideas. 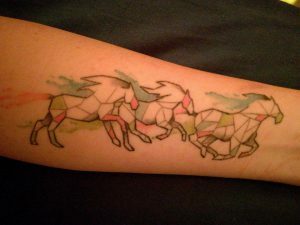 There are several types of tattoo, in this idea I chose to show you several. I start with a tattoo that is not finished. Juliette trusted the hands of Black Bernie who will complete the tattoo by dots (small dots) inside the rhombus. He simply represents his horse. In a realistic style with a little ornament (small flowers etc). In the meantime I received the finished tattoo of Juliet. It was made in Lyon and it had for €900 in all. Sabrina has when to her, trusts Dermacolor to Fontaine the bishop in Belgium for €125. This tattoo is rather New school. Cod that stinks, from his true name clemency evokes for his tattoo the liberty and the laurel wreath the greatness of the horse. 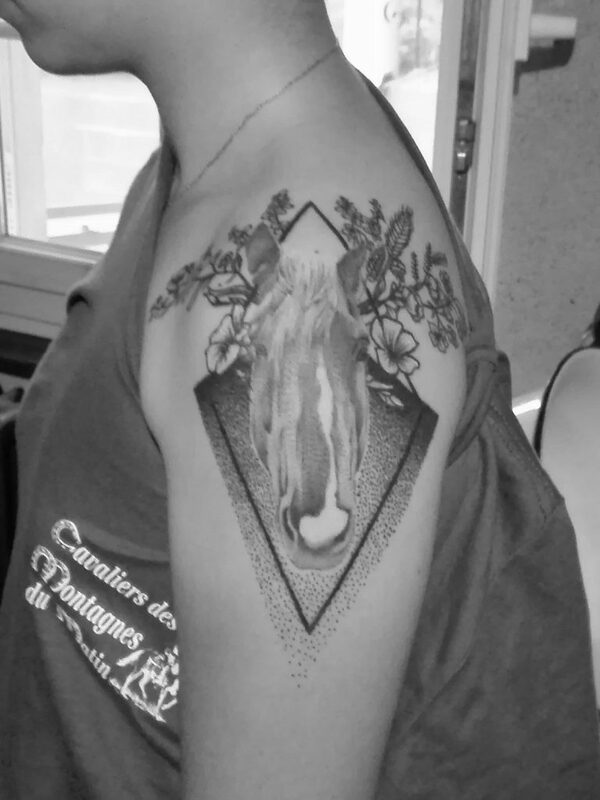 Done at Nantes at Rudy Mud Tattoo for €400. 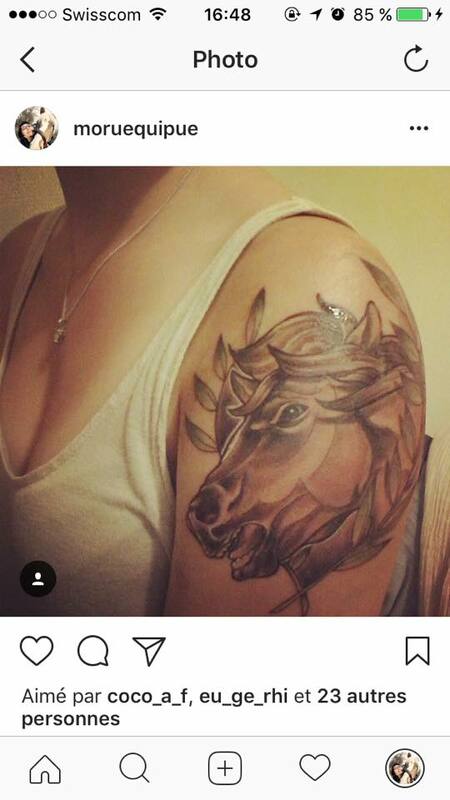 Even if the horse is realistic, the laurel wreath gives a little old school air to the whole. A little color. With the tattoo of Tatyana for this tattoo she talks about her passion, her profession and the film Spirit, which gives this reason to live. She had it done for €250. A little watercolor and geometry for this one. 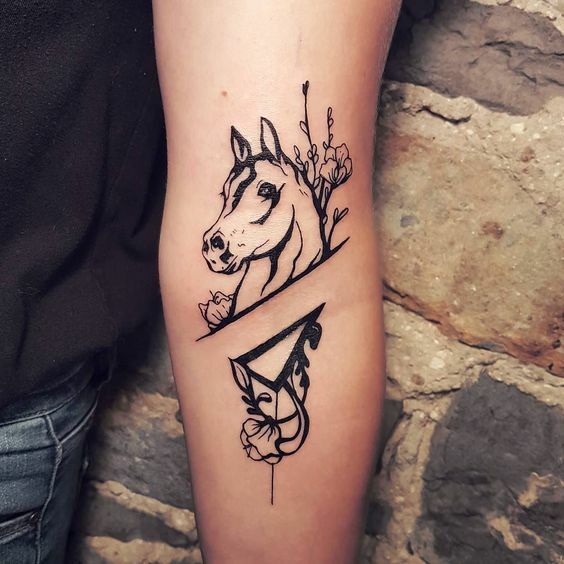 Julie’s tattoo is made for her two horses Iskéro and Sabroso. It was realized next to Toulon for €200. A very realistic portrait. Only one article on equestrian tattoos is not conceivable. The next few will arrive later, a little patience. If you want to share your equestrian tattoo, send an email to contact@chevaletmoi.com or a MP on Facebook.